About four days into some strenuous hoofing it up and down the steep Berchtesgaden slopes in Bavaria I realised despite walking more than 20 kilometres a day, I was actually putting weight on rather than losing it. 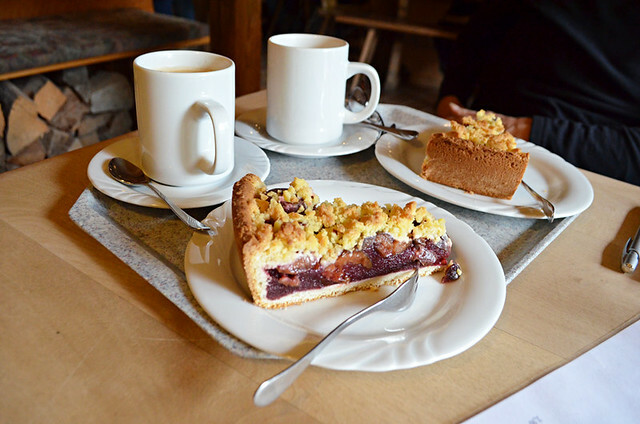 I blame the tradition of kaffee und kuchen, a ritual observed between 3pm and 5pm daily in Germany when folk meet up for a coffee accompanied by a generous slice of cake. 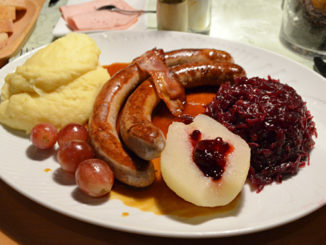 German cuisine is hale and hearty in its own right. Throw in an additional aeroplane chock-sized wedge of cake each day and it’s no surprise the Germans are such keen walkers; they have to be otherwise they’d be in the running (waddling) for the title of the most obese nation on earth. For most of my life have been immune to lure of cakes and sweeties. Whereas Andy will save a spot for dessert when we dine out, I prefer to sacrifice pud in favour of pigging out on savoury starters. 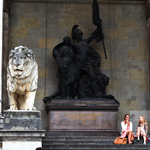 Walking in Germany’s Black Forest changed that. It was cooler than we had anticipated. Summer became winter almost overnight, to the point it even snowed a few times. Our bodies craved fuel and it just so happened we completed most of our walks slap bang in the middle of the kaffee und kuchen window. 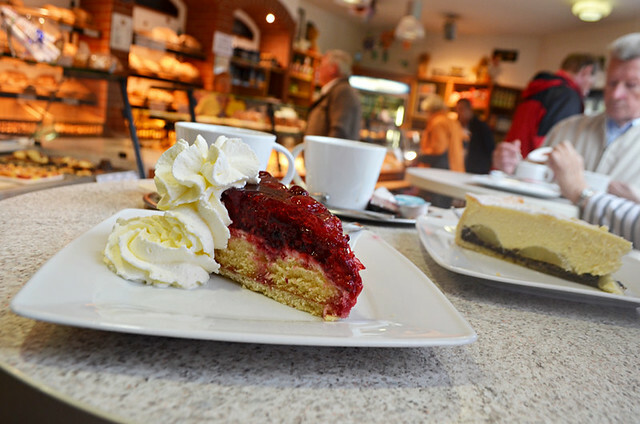 No matter how small the village was where we ended up, there was always somewhere offering kaffee und kuchen. 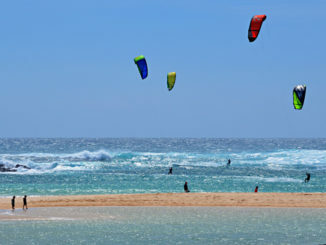 As we’re dedicated to participating (indulging) in local traditions when we travel we observed the ritual. 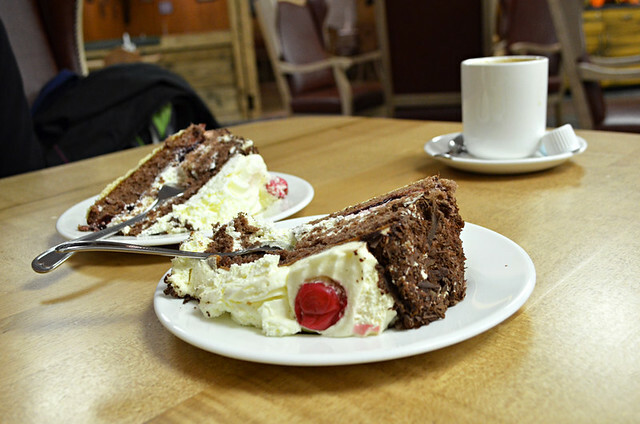 Being the Black Forest, the kuchen on offer was more often than not Schwarzwälder Kirschtorte – Black Forest Gateau. In Britain Black Forest gateau is a passé dessert, a throwback to 70s/80s dinner parties. 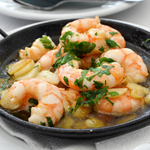 If throwing a retro dinner party I’d serve it after a meal consisting of a prawn cocktail starter followed by gammon steaks with pineapple rings on top. In the Black Forest though a wedge of layered chocolate cake filled with whipped cream and Kirschwasser cherries topped with chocolate shavings, more cherries and additional whirls of cream was no smirking matter. When stepping from a snowy forest landscape into a lodge heated by a roaring fire it was welcoming, warming, comfort food. 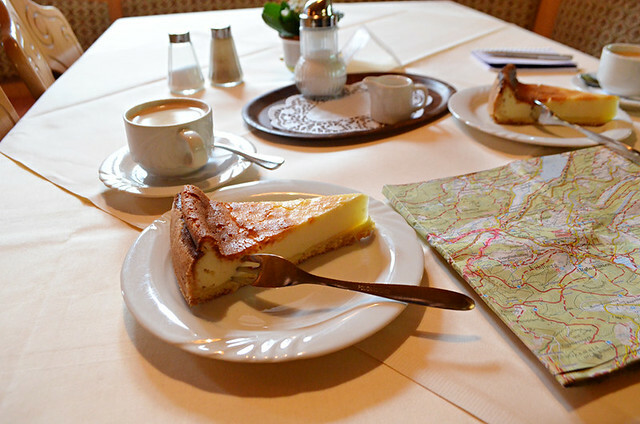 The kaffee und kuchen habit continued over various walking trips to Germany, hence the weight gain in Bavaria. The coffee was consistently good, not judder-inducing bitter as in some places (Spain, I’m pointing the finger at you here) whilst the type of cake might vary from Black Forest gateau to apple strudel (a pastry I know, but still sweet and sinful) to cheesecake. 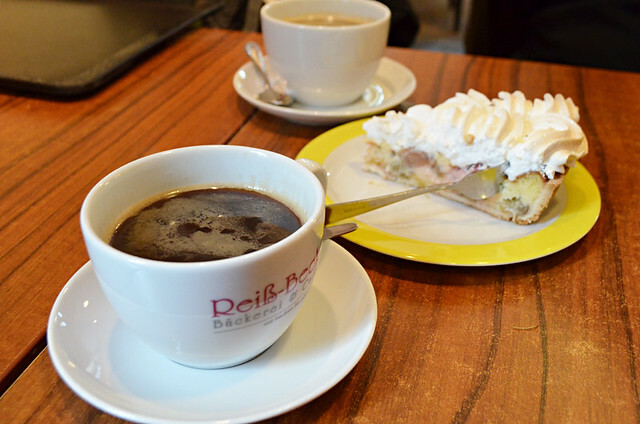 Kaffee und kuchen was like being given a warm hug on a cool day. The funny thing is outside of Germany I have absolutely no yen for cakes with my coffee, or at any time. I pass cake shops without a glance… thankfully. When it comes to kaffee und kuchen what happens in Germany, stays in Germany.